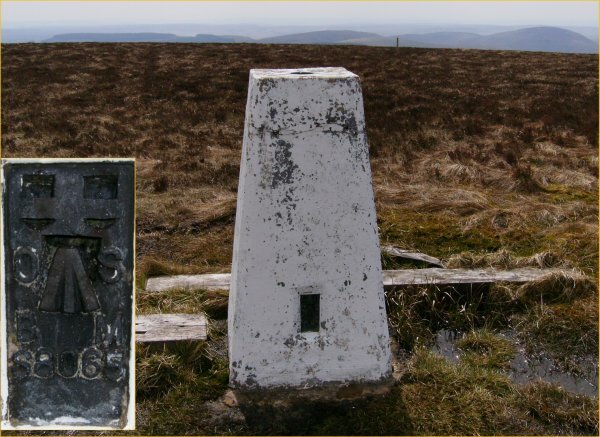 Is ranked joint 1914th with 30 other trigs (more). 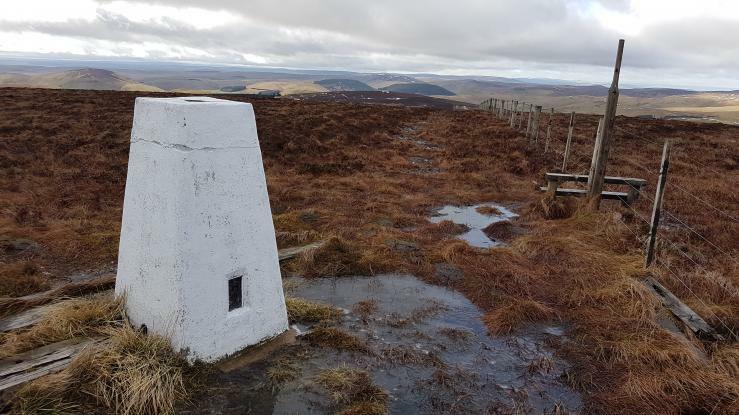 Long walk in from Weeder leap car park paths quite boggy today freezing cold wind.Spectacular 360 degree views especially to the partially covered Cheviot mountain trig in vgc painted white.Walked on to Cushat Law My penultimate Hewitt English mountain top number 179. 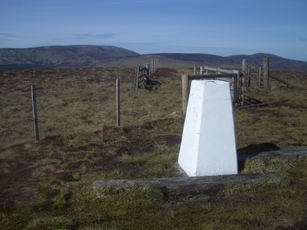 From Cocklawfoot along Clennell Street over the border ridge down to Uswayford then on to the pillar, returned via Yarnspath Law. A bit blowy but blue skies, dry ground and decent paths all the way. The pillar still looking good in it's new coat. Parked near Barrowburn. 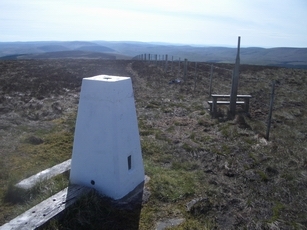 North via Uswayford then east to the summit. 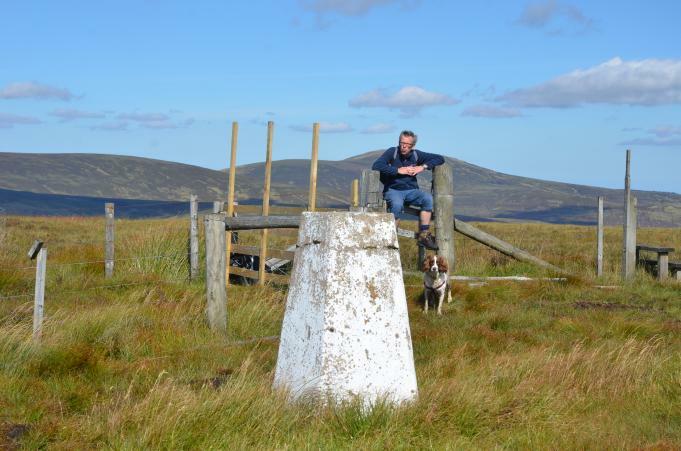 1st of 3 trigs today. 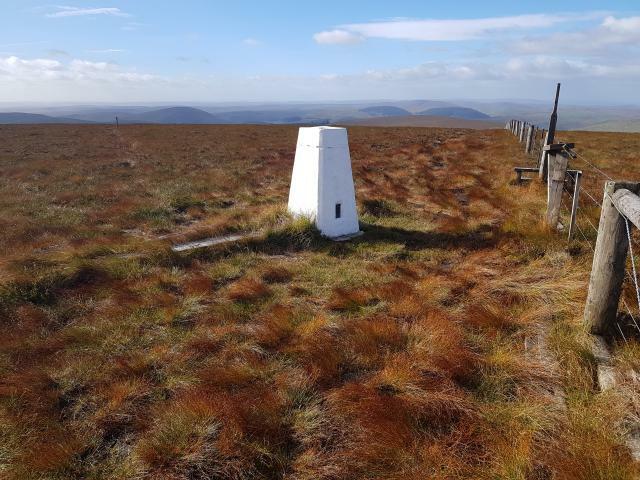 Blue sky, dry underfoot and plenty of time to absorb this lovely area of the Cheviots with its rolling hills and patchwork plantations.This trig still has a hearty splash of white paint on all sides. Crack exists on top section .Lots of abandoned fence posts nearby. Parked in the Wedder Leap car park and followed the track via Middle Hill to Uswayford. Then up the bridleway and finally along the fenceline. Tremendous view of the border ridge. 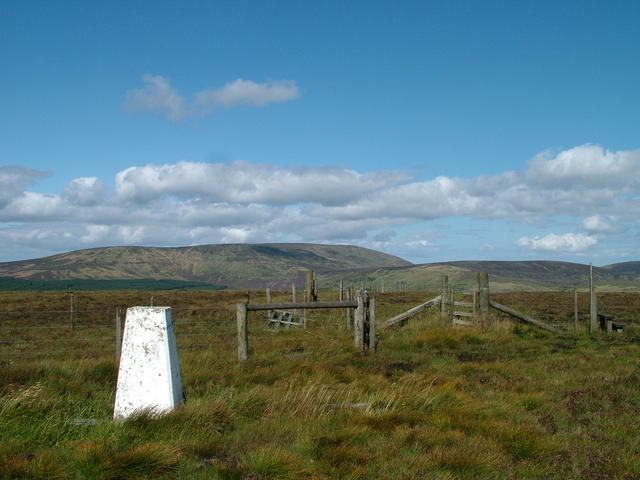 Cross Fell and the North Pennines were visible. Misses out on a 10/10 because the untidy fences spoil the ambience somewhat. 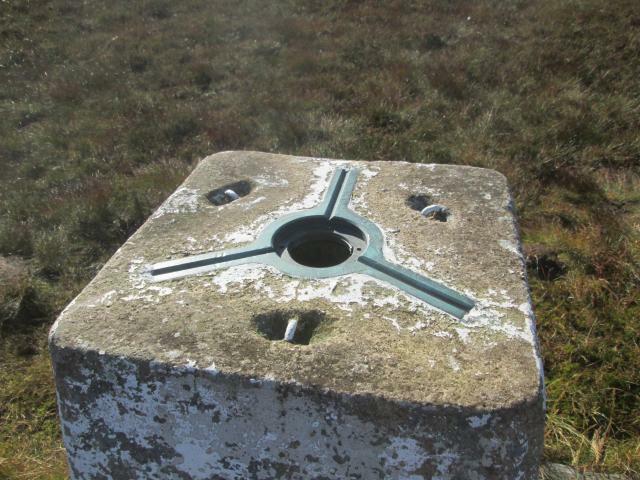 Suffers from same complaint as nearby Linbrig trig, though not as bad: cracked all the way round in top third. 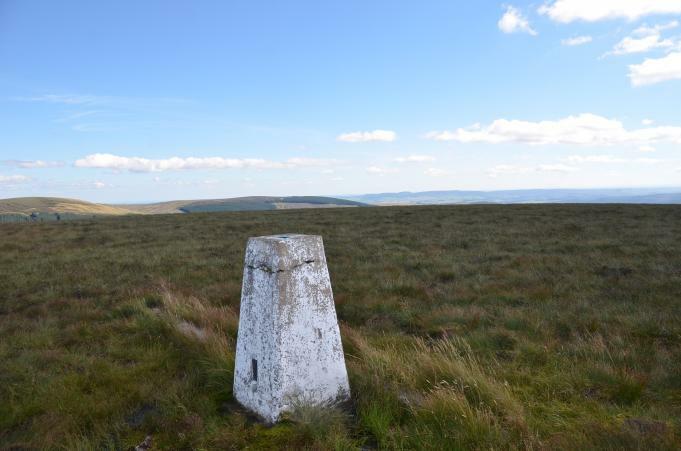 Bloodybush Edge View of trig. 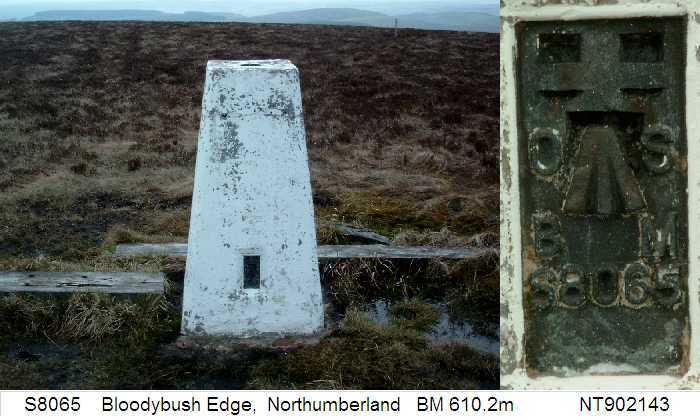 Bloodybush Edge Top of trig, no cap and crack. *27/08/16 Redid the walk below, adding Hogdon Law for good measure. Views today were STUNNING, perfect air clarity. 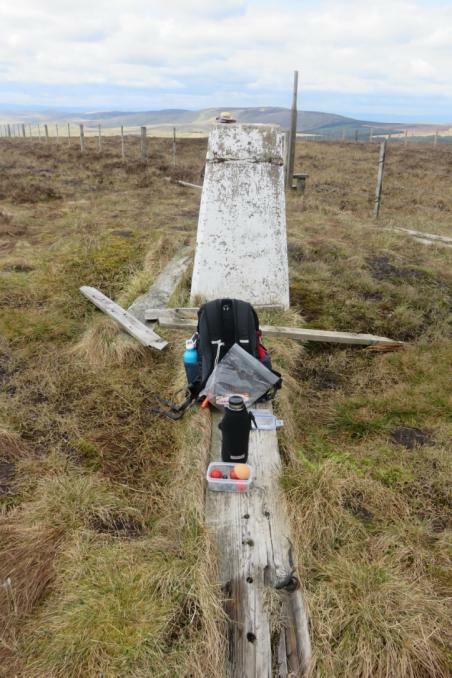 Accompanied by Andy Withers, new to Trig-Bagging. Have re-scored this hill now we know what can be seen! 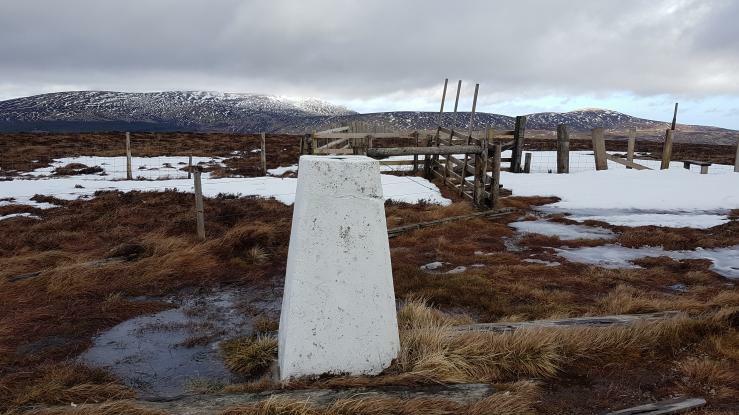 **05/03/16 A fairly grim day of weather, we added Wether Cairn as a short diversion onto a 6 hour hike that took in Cushat Law and Bloody Bush Edge and back along Salters Road through the top end of the Breamish Valley. 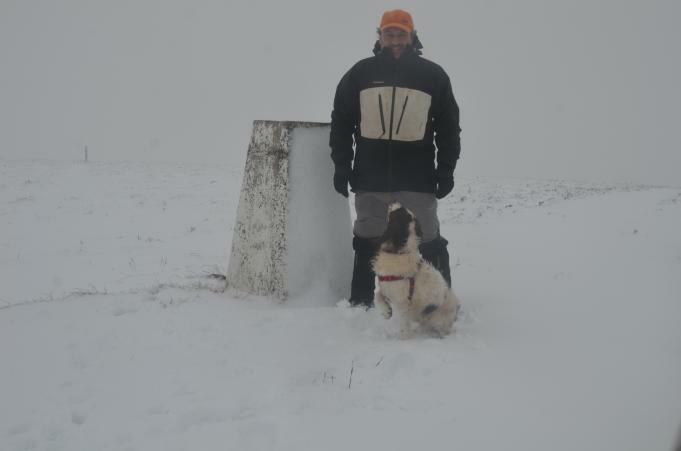 All in clag (and snow, and hail, etc) so the views from the Cairn as yet unknown! A re-visit required on a clear day! View South West 29/08/16 - Same shot as before, different view! Bagged with Dusty then returned over four TUMPs. 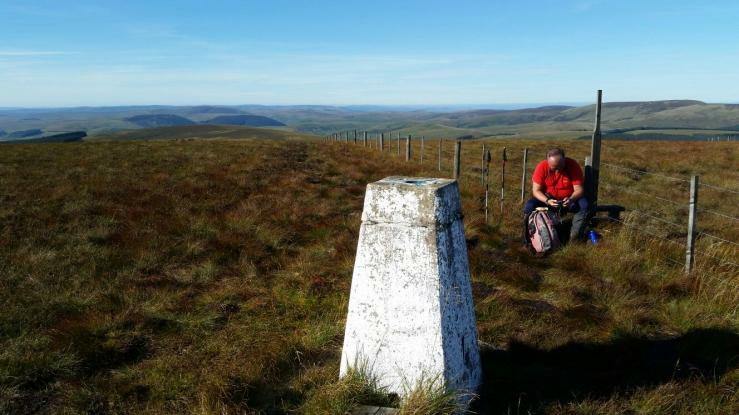 feels a long way from windy gyle but only 2hrs. the track theough forest is clear. a bit wet following the fence up through peat and heather. trig is missing cap and has a crack all the way around some 9" from top with moss growing in it. view is simply sensational. oh, & its unbelievably quiet. 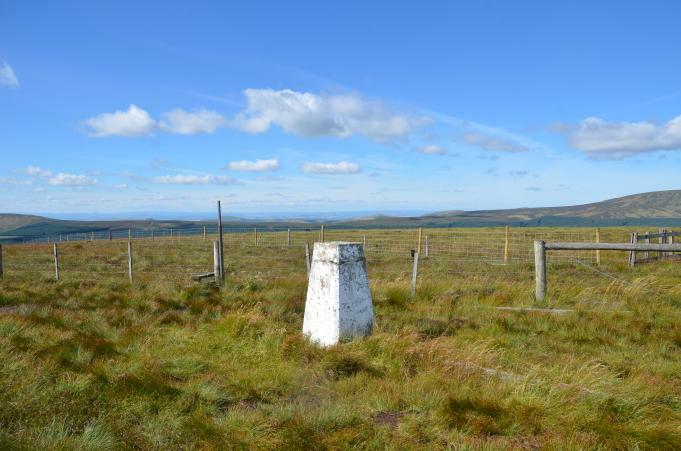 Excellent views to Lakes, Cross Fell and the coast. But it's a dull wet hill. We did a 20km round from Upper Coquetdale via Kings Seat and Uswayford, then back via Uswayford to the car. Another wander round the usual circuit, this time on a very windy day. The route from here involved a lot of hopping from one side of the fence to the other as the path had been destroyed by motorbikes. Alwinton round...15.2 mile in very strong winds making the going so much harder. Cracked 1 ft from top. Spider centre open. From Breamish valley as part of a 24 mile circuit. 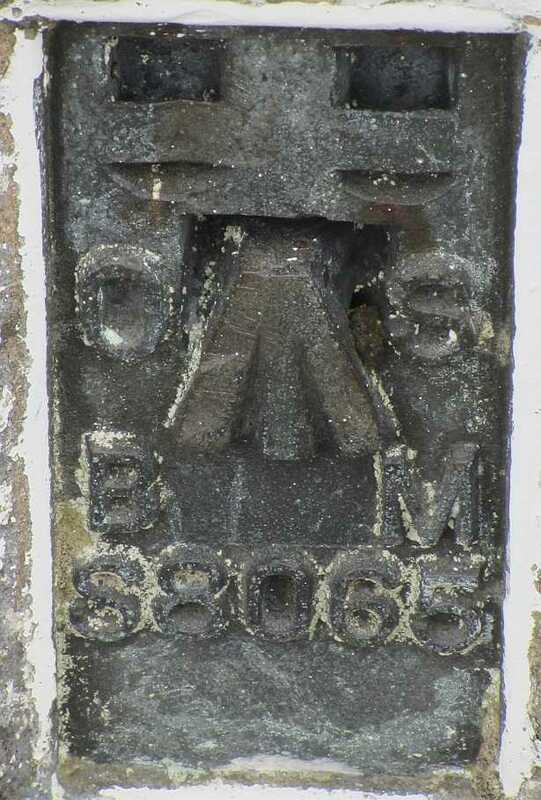 Previously visited this Hewitt 06/10/05 no trig details noted. Parked close to Uswayford farm and then accessed the wide track through the forest before the final wet ascent of the summit (my 250th English 2000 foot-er). Continued across to Cushat Law (my 251st) before descending the north-easterly ridge back to the main track and then making the long walk back to Uswayford (further than we had imagined). A hard day, but only 2 x 2000 ft mountains in England left to visit, one of which I will never ascend (Pillar Rock). 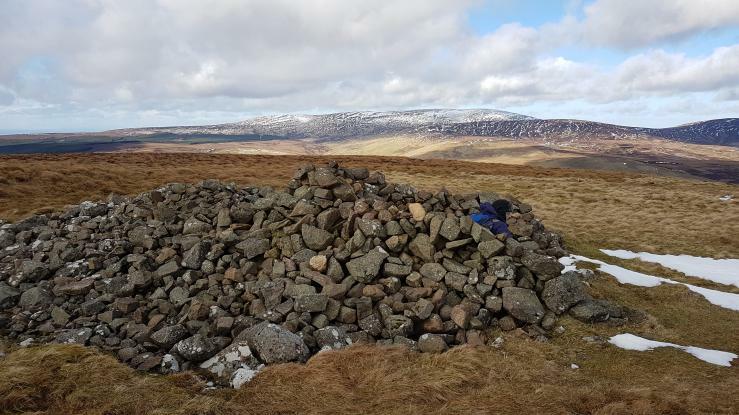 Annual visit on the round from Alwinton vi here, Cushat Law and Wether Cairn. Fine, breezy day with the odd shower and great views. 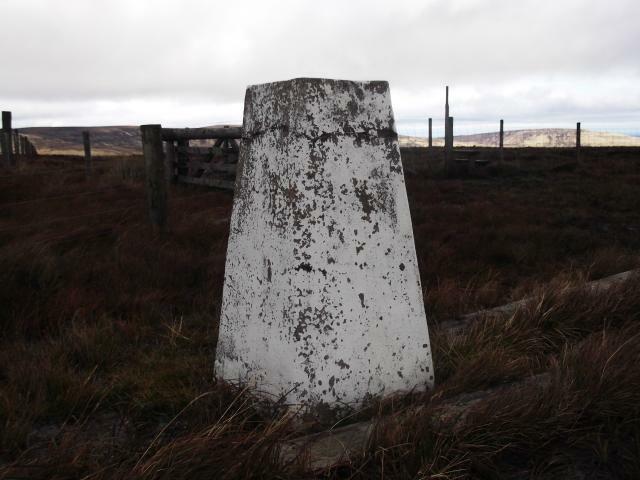 Paint still flaking off the trig. Shivering Stone still a great viewpoint. 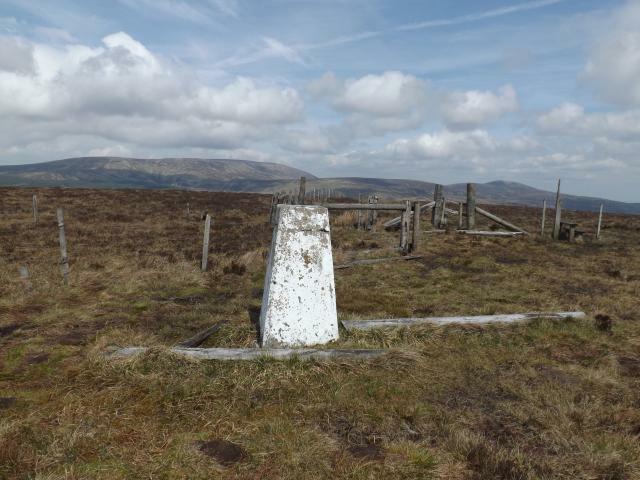 Same route as last time without the extra visit to Linbrigg trig. 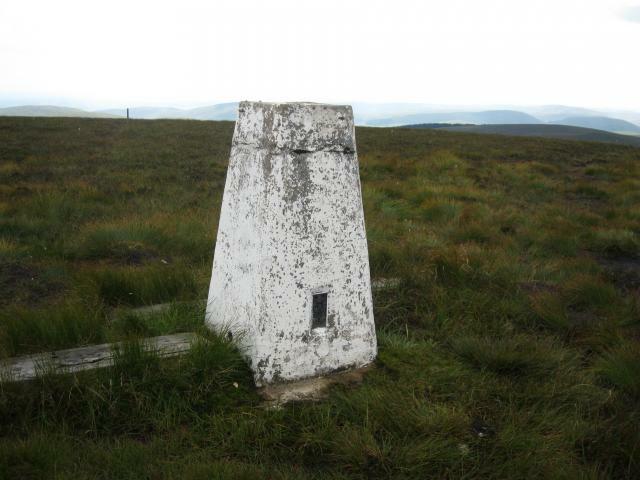 I remember back in 2005 that this trig was newly painted, well that paint is beginning to flake now! 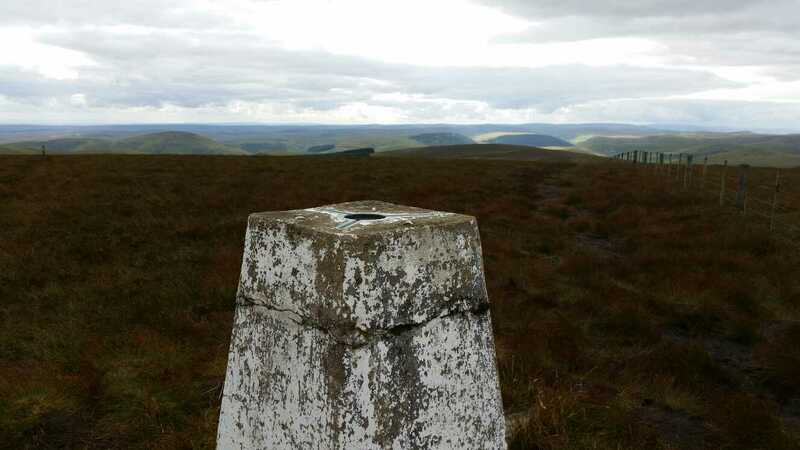 Walked over from Windy Gyle on the Nutalls route which was OK till the farm then hard work from there. 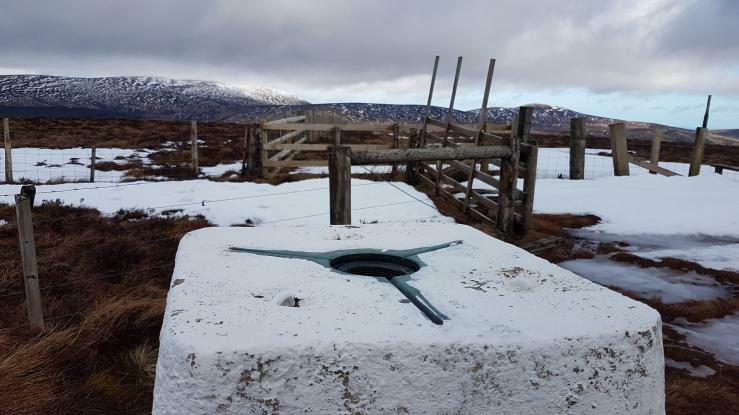 After visiting this trig went out and back to Cushat Law which was very hard work through the bog especially hving fallen and cracked a rib yesterday trigpointing. Repeat of 2006 route. 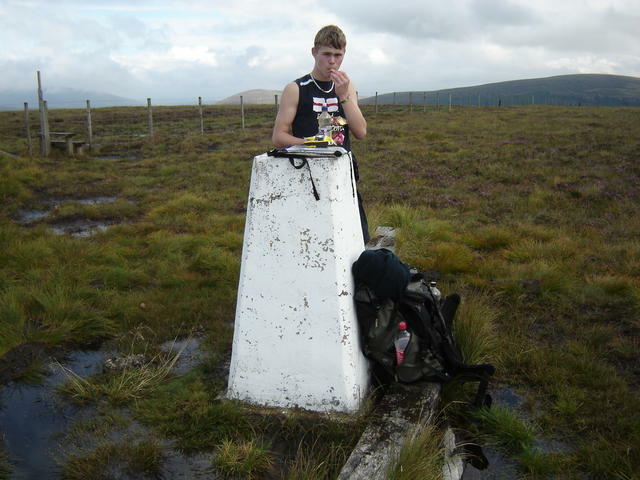 Did the Alwinton Horseshoe anti-clockwise and onto Linbrigg trig after this. Weather hit and miss but ground was dry. 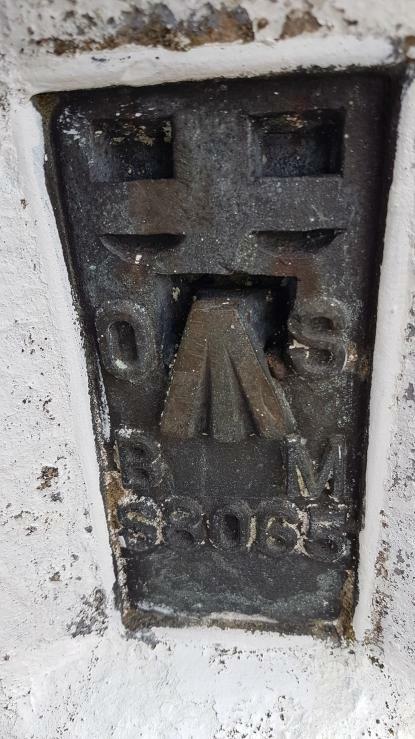 HISTORY: Pillar completed 29th June 1954 costing �66.7s.6d. 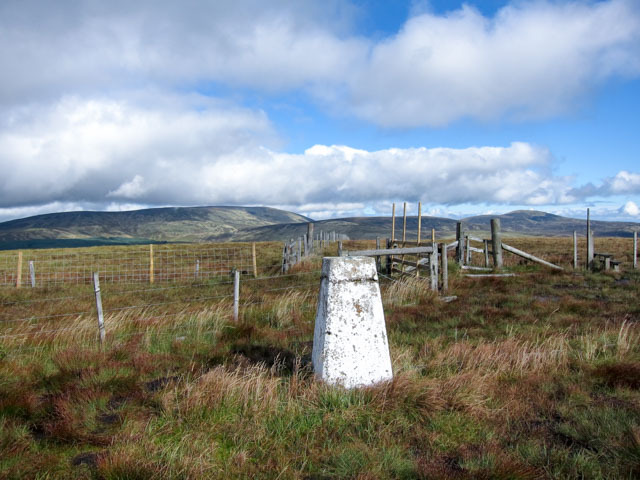 Computed as tertiary triangulation station NT72/T11 during 1957. 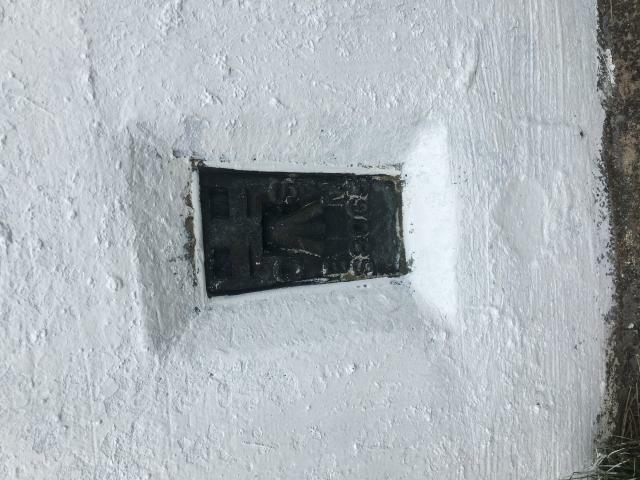 Levelled for height to Class 2 precision in 1958. Last maintained by the OS in September 1978. SITE VISIT: Overall approach from WSW. Parking for approximately eight cars at NT859114. Followed tracks to Uswayford, across footbridge north of farm, and up! 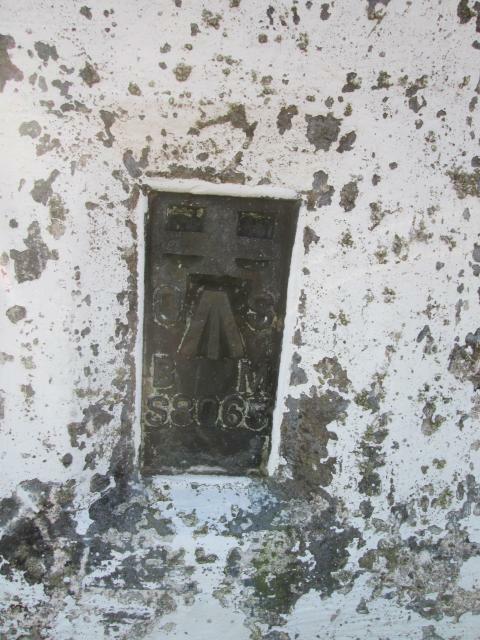 Pillar in fair condition, still painted white. Spider centre open. 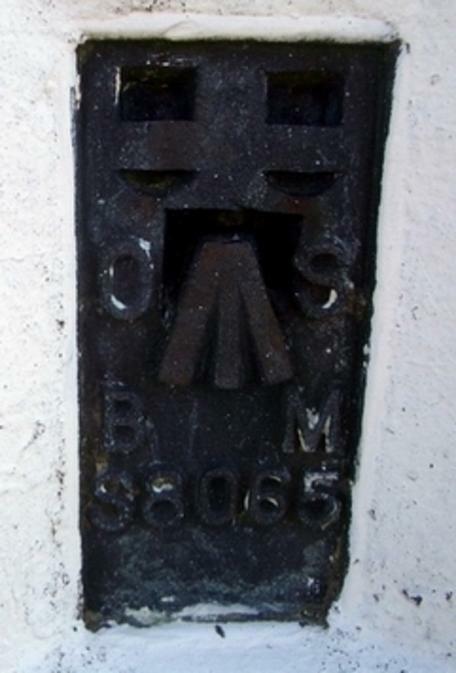 Flush bracket faces north, compass measurement 9�. 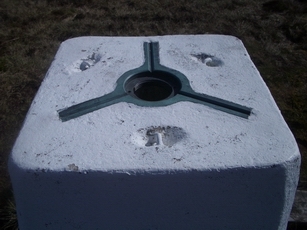 Vented through left (east) sight hole. GPS reading is genuine! 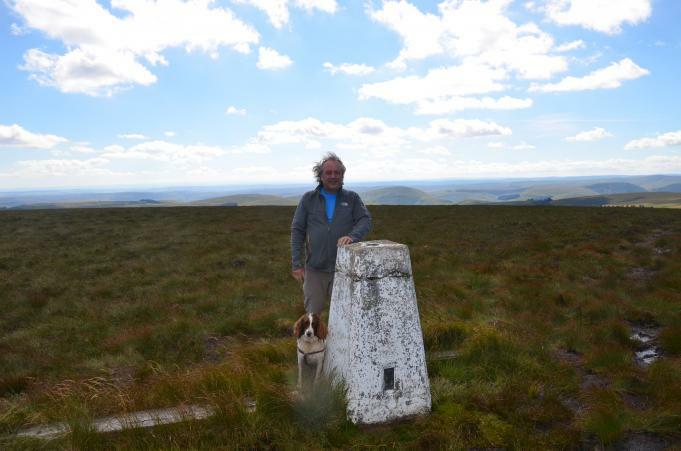 Views to Windy Gyle, Kings Seat, Cheviot, Hedgehope Hill, Shill Moor, Shillhope Law, Thirl Moor. From Alwinton via Cushat Law on a wet and windy day. An after the event entry. Visit made before my finding this site. 51 weeks since my last visit and this time in far better weather. I didn't realise how good the views were from here. 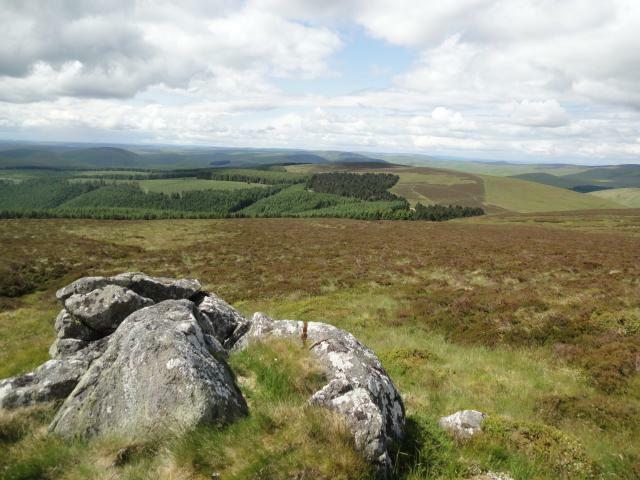 You could see all the Cheviot tops, Simonside and north into Scotland. 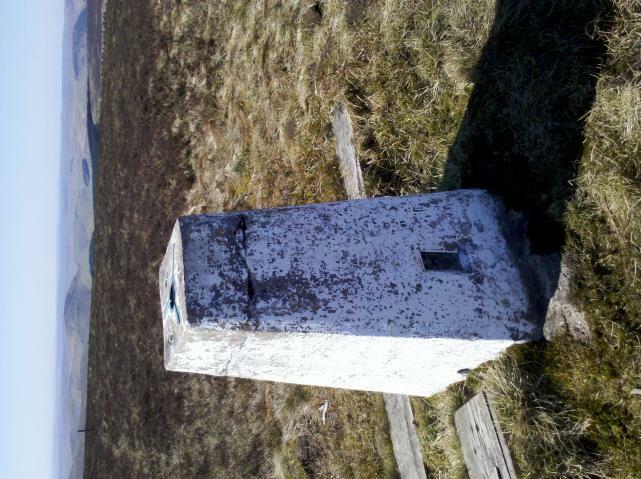 Trig in very good condition with new paintjob still prominent. 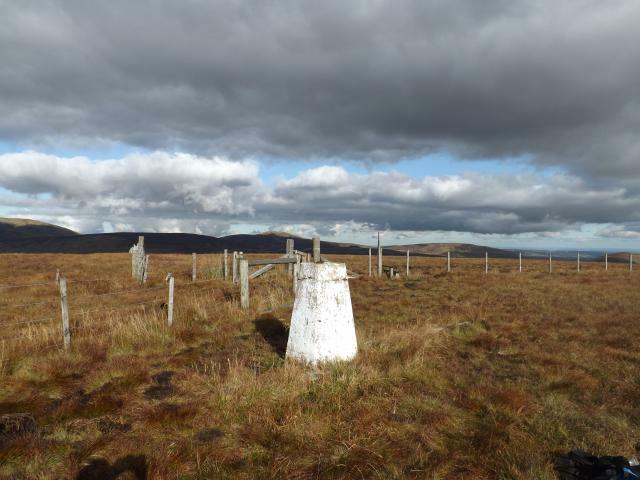 The Shivering Stone on the south slope of the hill is a great place to stop by the way as the ground surrounding the trig can be a bit wet. 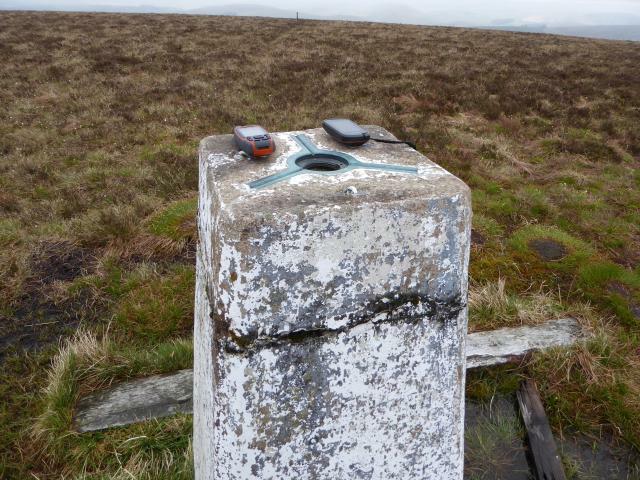 very wet in area of trig, good views in all directions. dinner time, still 3 more hills to go. 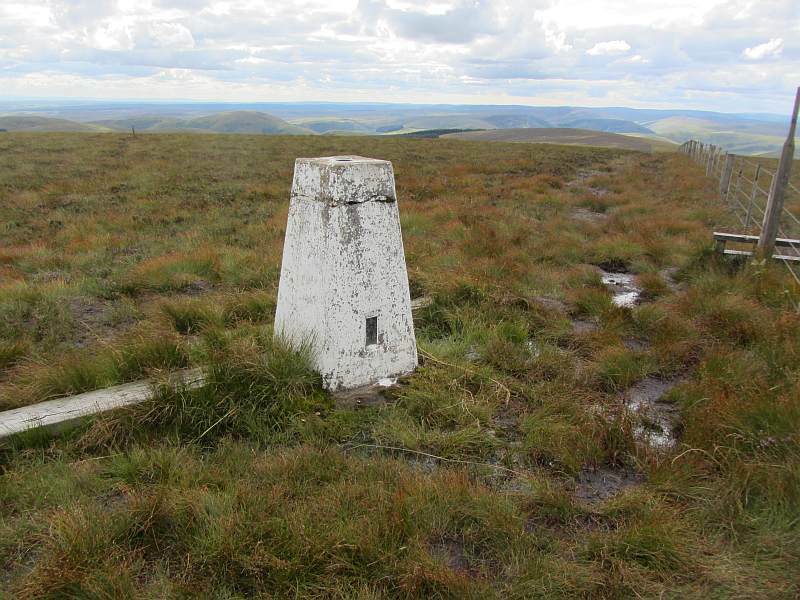 Flat summit and quite bleak. TP surrounded by damp ground. Newly painted white. No cap or plug. 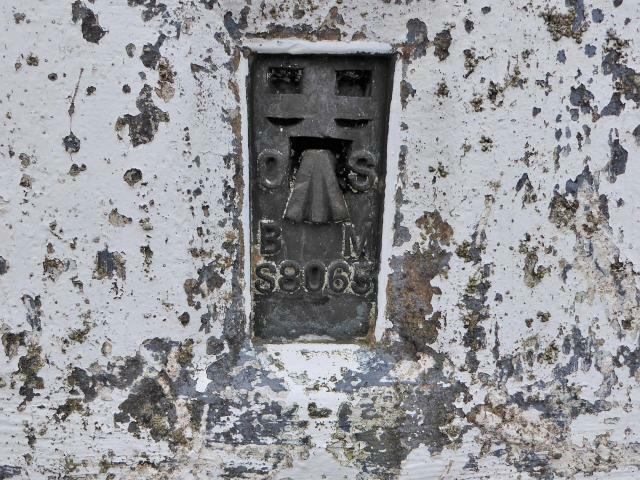 Horizontal crack around trig near top, guess it will someday go the way of S8058. At fence jct, heathery summit, good view. 1st visited 03/01/1998. 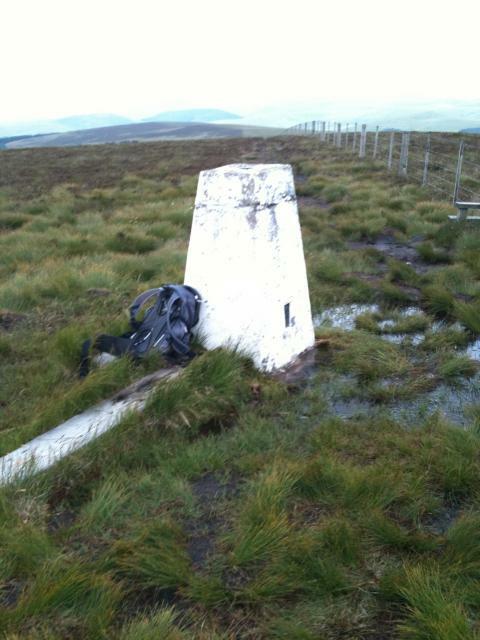 Revisited to bag the trig, as part of an intricate (and as it turned out, 20 mile) 400m top bagging route from the SW. 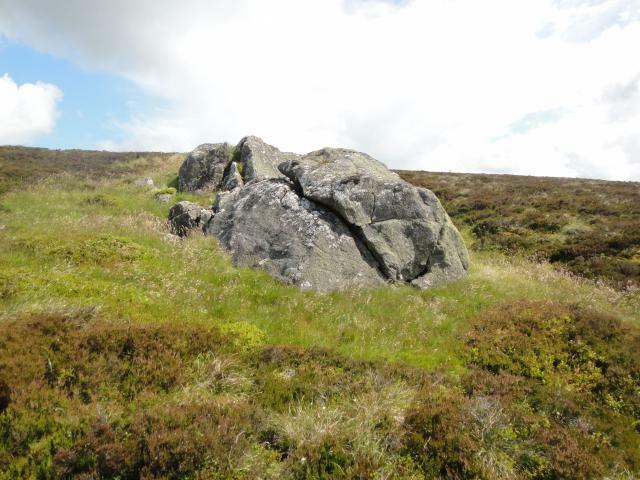 Visited during a long and hot day on the Cheviot hills. Up from Alwinton, via Cushat Law. Long walk through the forest, then moorland. Seemed to take forever returning along Clennell Street in the dark. 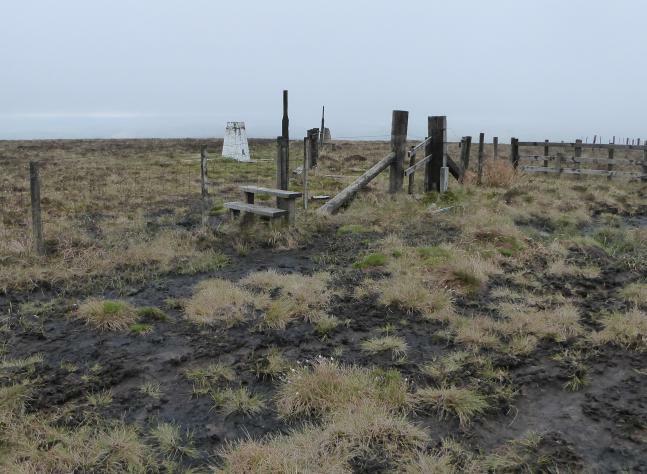 Rough going, typical southern Upland fence junction summit. Weird doing these sort of hills in England. Visited from whiteburnshank as a break from painting. We nipped up in shorts and t shirts and met a group in full winter gear on top of hill huddled round stove having a brew. followed fence to top. No sign of "edge" - rounded dome. solitary grouse.